BAH Note: File this away for the dog days of summer when you can’t swing a stick without hitting a zucchini. Place all the dry ingredients into a bowl and whisk to combine. In a second bowl, mix together the egg, milk, and vanilla. Add the zucchini to the wet ingredients and stir to combine. Fold the flour mixture into the zucchini mixture until just combined and allow the batter to sit for 10 minutes. Cook the pancakes in a nonstick skillet, lightly coated with vegetable oil, for approximately 3 minutes on each side or until golden, brown, and delicious. I’ve said that Miss Libby at 2 is a glimpse at what I can probably expect in about 10 years (or sooner!) when puberty starts rearing its head. What with the tears and tantrums and drama, toddler and teen really aren’t that far removed from one another…and boy, if one is a preview of the other, then I’m in for it. So it’s kind of fitting that I chaperoned Miss Libby’s first date last weekend. He’s a younger man so his parents were there too. Neither of the kids seemed to mind though. Or if they did, they haven’t figured out the eye roll and the embarrassed sulk. We have to wait a while yet for that. Actually, I’ve been trying to make this date happen for about the last nine months. And I may be lobbying for something of an “understanding” between the two families as far as the kids go because these two are too cute together not to be together. There may not have been any hand holding but that was probably because because both kids were using their hands to eat. Something about seeing Libby pass pieces of quesadilla across the table to Evan and watching him accept her gift made me very happy. BAH Note: If the way to a man’s heart is through his stomach then I see no better vehicle than a biscuit. 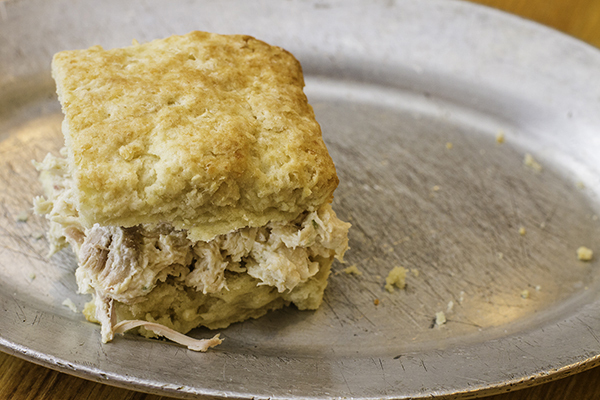 Adorned simply with butter and jam or used to sandwich a savory middle, this biscuit is your friend. Oh, and I find it easier to cut the cream cheese and butter into cubes after they come out of the freezer. Give it a try, you might too. Heat your oven to 425 degrees and line a sheet pan with parchment. Put the dry ingredients, cream cheese, and butter into a food processor and pulse until the mixture looks sandy and no big pieces of butter or cream cheese remain. Transfer the flour mixture to a large bowl. Add the buttermilk and stir until the dough just forms. Transfer the rough dough onto a floured counter and knead it until it all comes together. Roll or push the dough into a rectangle (the longer the rectangle the thinner the biscuits, the shorter the rectangle the taller the biscuits) and cut into biscuits. Transfer the biscuits to your parchment lined sheet pan and bake for approximately 15 minutes or until the biscuits are golden brown. Back in the day….and by that I mean 2012…I was on Twitter. All. The. Time. Why? Because I could. And because I wanted to. In the virtual world I don’t need to worry about being socially awkward. It’s hard to stumble over your words with only 140 characters. But it’s easy to join in a conversation, or better yet, to spark one. Most of the time in real life I stand back and listen to conversations go on around me. But on Twitter I can be witty and lively in the conversation. And I can sound as though I know what the hell I am talking about….in real life, that’s not the case much of the time. 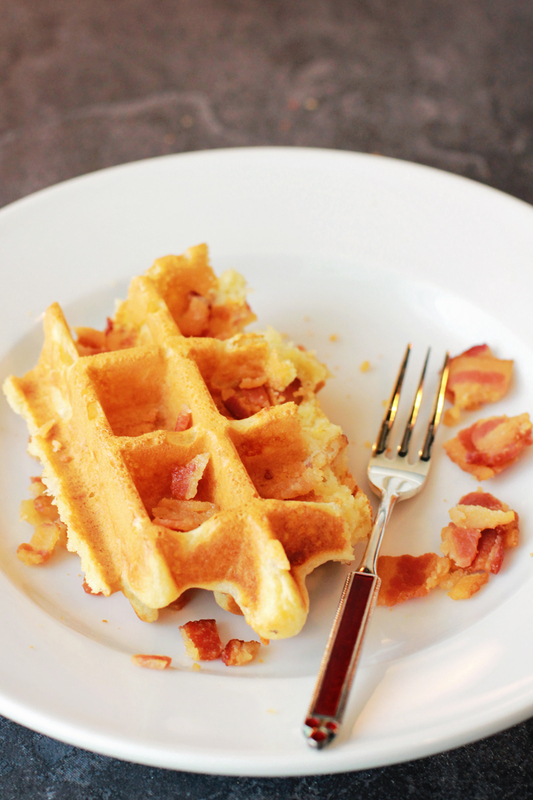 For example, let’s consider a recent tweet…”All waffles should have bacon and cheese in them.” That statement is A) clever; B) authoritative; C) truth; D) common sense. Actually it is all of those things, but it’s not the kind of statement that I would make in the course of casual conversation. Unless our conversation was about waffles, bacon, or cheese. Or you had previously resided in a dorm, house, or apartment with me. But the odds of that happening are pretty low so I’m confident in saying that it’s unlikely I would say that to you in an ordinary conversation. 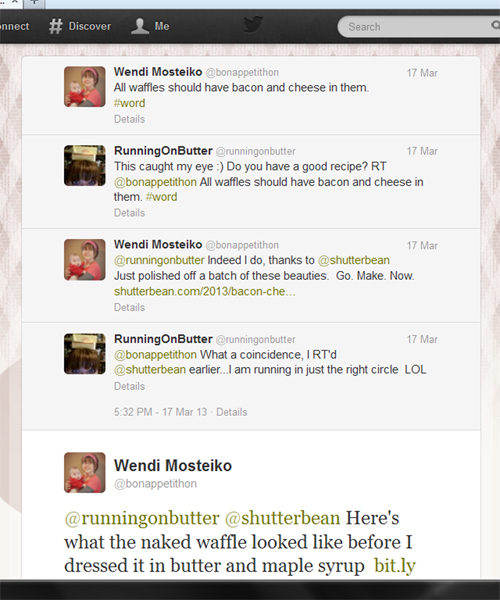 And yet it led to a conversation on Twitter where RunningOnButter believed that I spoke as a waffle authority. RunningOnButter doesn’t know me outside of Twitter. ROB doesn’t know if I have any credentials to present myself as a waffle authority. But ROB took my pronouncement that bacon and cheese are integral waffle components as the truth. So now, thanks to Twitter, I am a waffle authority. I don’t think I will add that to my resume. But it’s the kind of thing I would use as small talk…if I were inclined to make small talk. As it is, most of my free time and conversations are with a pre-verbal toddler. And until she realizes otherwise, I am an authority on everything! Set a wire rack inside a sheet pan and heat your oven to 200 degrees. Combine the flour, baking powder, baking soda, and salt in a medium bowl and whisk until blended. Add the cheese and bacon to the flour mixture and stir to combine. In a large bowl, whisk together the eggs, milk, and oil. Add the flour mixture to the milk and egg mixture and stir to combine, being careful not to over mix. Grease your waffle iron and get it heating. When ready, pour 1/3 cup to 1/2 cup batter into your iron and cook until done. Transfer the waffles to the prepared sheet pan and give them a 10 minute rest in the warmed oven. Slather with butter and syrup. BAH Note: Feel free to use just about any vegetable. Pam suggests sliced mushrooms, halved cherry tomatoes, thin asparagus, diced leeks, or even thawed frozen spinach. Place oven racks in the top and bottom position and heat oven to 400 degrees. Roll the puff pastry out on a lightly floured surface until it is just larger than a 1/4 sheet pan. 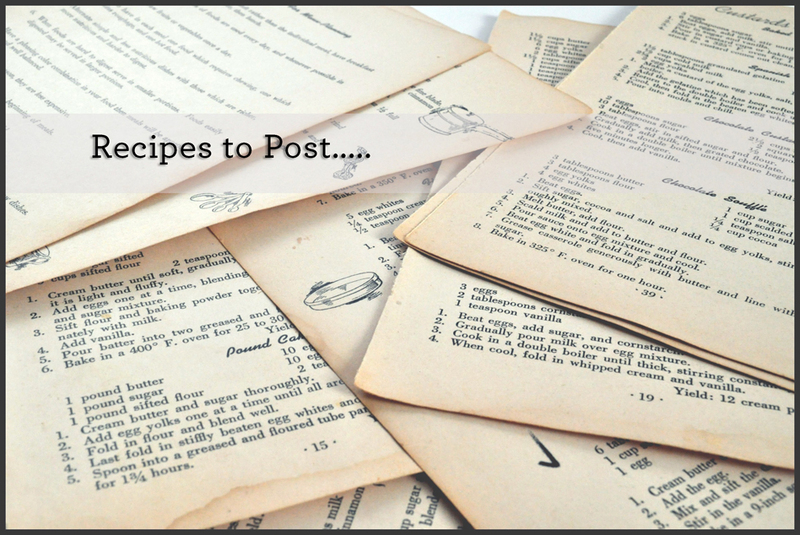 Transfer the puff pastry to the sheet pan, trimming off any overhang, and docking the pastry all over with a fork. Spread the butter braised onions, or vegetable of your choice, into a single layer on the pastry. Bake on the bottom oven rack for 10 to 20 minutes or until the puff pastry is golden brown. While the puff pastry bakes, heat the evaporated milk until it is just warmed. In a separate bowl, use a fork to beat together the eggs, salt, pepper, thyme, and sour cream. Once the egg mixture is completely combined, stir in some of the warmed evaporated milk, about a tablespoon at a time, to temper the egg mixture. Whisk the rest of the evaporated milk into the egg mixture before pouring the egg and milk mixture into the puff pastry and evenly sprinkling the cheese on top. Reduce the oven temperature to 300 degrees and place the sheet pan on the top rack. Cook for 20 to 25 minutes or until the egg filling is just set. Then set the oven to broil and allow the top of the quiche to brown for about 2 minutes. Allow the quiche to cool slightly before serving.